I have long been an advocate of painting landscapes from memory. My theory is that by a certain age one has many "memorable" scenes in their mind. I've gone through periods of painting this way and it has been fun to see what happens. 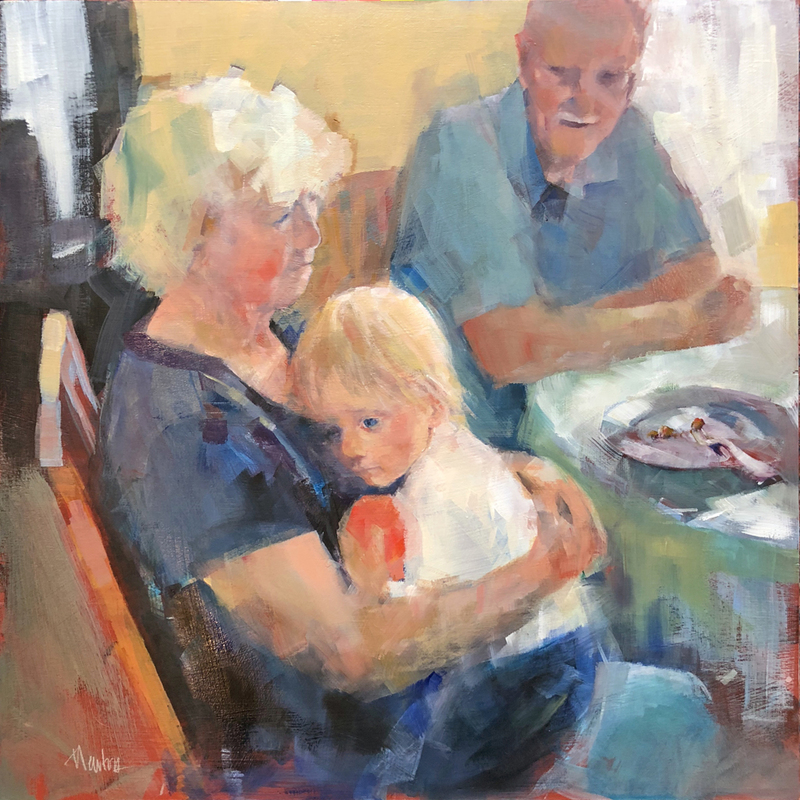 For the past couple weeks I've been working on a figurative painting from a family photo of my sister, her husband and their great grandson. My goal was to NOT create a likeness of the specific people but a more abstracted approach. However, when a likeness of my sister (the great grandmother) appeared, I felt the need to get a likeness of the great grandfather too. On to the child and my memory problem. I was a teenager when my sister married and began having babies, two girls then a boy. I spent a lot of time with those little kids. They grew up and had children of their own. Then those children grew up and along came this child I'm trying to paint. I am not well acquainted with this little boy but I do have the reference photo. However, for the past week I found myself painting a face with the likeness of the child's great aunt (the second born of my sisters two girls). Yesterday, I had a moment of painting the child's grandmother's face as I remembered her as a toddler. Aaargh. I just want to paint what I see in the reference photo but apparently I have visual memories of his relatives that have been in my mind for 60 years. Hmmm....this is a problem. Going back to it this morning to try again. You have, in my view, painted the likeness of a memory many have of their own grandparents. And how that felt. . . even better! Am I living the art-life I intended?